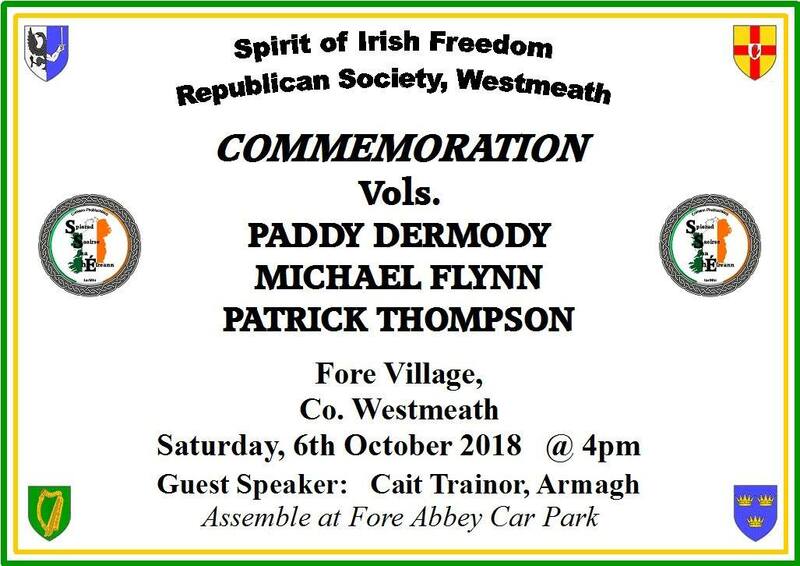 Address given 06/10/2018 in Fore Village, Co. Westmeath at the Spirit of Irish Freedom Society commemoration for Vol. Patrick Thompson, Vol. Paddy Dermody and Vol Michael Flynn. Firstly, I would like to thank the organisers of this commemoration for giving me the honour of addressing you all here today, the ongoing work, that the Spirit of Irish Freedom society do by commemorating patriots from the locality and surrounding areas is not only very important from a historical point of view, but essential for the ongoing campaign to re-establish the Irish Republic. We have heard from the Chairperson of the lives and sacrifices of the 3 men that we come to commemorate, Vol. Patrick Thompson, Vol. 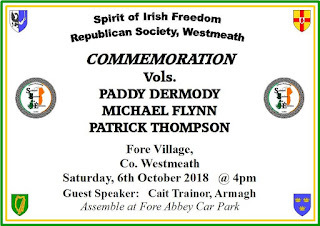 Michael Flynn and Vol Patrick Dermody are only but a few of the prominent Volunteers that hailed from this area, these 3 men dedicated their lives to the cause of a free Ireland, all of these men died while on active service for the Republic, 3 young fearless men who put their Country and duty before everything else and who ultimately gave their young lives in that cause, Patrick Thompson was 34, Michael Flynn was 35 and Patrick Dermody was just 22. Each of these young men made a hard decision to sacrifice what could have been a long and comfortable life in pursuit of Irish Freedom, they undoubtedly knew upon joining the ranks of the IRA what hardships where to follow. In Ireland today while so many ignore the realities ongoing around them, we too have dedicated men and women willing to stand up and do their duty for the Republic, dedicated political activists and campaigners. It is essential that we acknowledge them too, for it is not an easy time to be a Republican, we face constant media censorship, state criminalisation and harassment at every turn and yet we continue. The attempts to break Republicanism are unrelenting, many political activists face arrest on trumped up charges simply for speaking out. The scores of political prisoners both North and South give truth to the lie that we are living in a normalised state. The continued use of the Special Criminal Court in the Freestate against Republicans is nothing more than a charade of justice, just this week we have seen the start of a Supergrass trial, up before the special criminal court are 3 republicans, all facing life in prison on the word of a Supergrass, namely Dave Cullen. To date based on the statements of Dave Cullen 9 men in total have been arrested, so far 2 of them have been convicted and are serving lengthy sentences. Cullen like many supergrasses before him will brazenly give evidence to the special criminal court against Republicans. It is believed that in return for this, Cullen has secured immunity from his own murder charge, has been assigned a new identity and has been given a cash lump sum along with a monthly stipend. Of course a person of low moral character will lie for the above benefits, while Dave Cullen will financially gain from these lies, 3 men could potentially face life in Prison. The use of a Supergrass in 2018 is absurd, Supergrasses have been proven to be liars, many enticed by monetary rewards and the promise of immunity themselves, these undesirables are prepared to do and say anything to save their own skin. Supergrass Trials have a long and chequered history in Ireland, they went out of vogue in the late 80’s when the Touts where found to be entirely non credible, the current case taking place in the Freestate will be no different. In the North we have interment by remand and plain old internment with the continued incarceration of Tony Taylor, a man who is in Gaol solely on the word of the British Secretary of state to Ireland, no solid allegation or charge put to him, no reasonable justification given as to why he remains jailed in Maghaberry. Today we send our Good wishes and solidarity to all those Political prisoners incarcerated in Freestate and British Run prisons in Ireland. The constitutional situation in Ireland has not changed in near on 100 years, our partitioned Country remains unchanged, governed in part by British rule and a reliant Freestate continuing to criminalise and crush Republicans at every opportunity. But we do have new challenges and situations that we cannot ignore, as much as I would like to skim over Brexit given the absolute Brexit Fatigue I feel due to the ongoing bombardment in the media, it would be remiss not to mention it. As Republicans many of us supported the concept of Brexit, not for any of the reasons the Brits or Unionists may have supported it, but because we believed that it would rightly expose the constitutional set up in Ireland, that it would highlight partition and that it may push people towards focusing on the Republic. We believed that with Britain making big changes it would focus minds in Ireland to also make big changes and hopefully lead to a resurgence of Republican sentiment, and we were right! Well to an extent. What we have now is not completely what we had hoped for, the focus tends to be on a more nationalist footing and less Republican, the proposed border poll that many are seeking due to Brexit does not exactly give us our demands, while there is a slim chance, and I emphasise the words slim chance that a border poll may end partition, the Re-establishment of the Republic is not at all on the horizon. I recognize that huge differences exist between groups within republicanism on this issue. I am simply saying that we must be the people to formulate our own destiny, we cannot bank on the whims of the British Secretary of State who may or may not decide to call a Border Poll. We cannot just gratefully react to the chance of a vote on unity. A border poll does not offer us true independence, it does not offer the re-establishment of the Irish Republic, it is at best a reformist short-term solution to create a new 32 County Freestate. I believe with the right focus our plans however could start to take shape, it would be foolish now not to see them through, we must hold out for the Republic, no concessions, no half measures. Let us take this opportunity to educate and lobby the Irish People for the actual Republic, let’s agree on a set of Republican Principles to move forward with, let us all unite behind a singular consistent message and give real leadership to the Irish Nation. We must collectively give a commitment to stand firm behind the Republic while insisting that the British must make a public and unequivocal declaration of intent to withdraw from Ireland. In conclusion, as we move forward in these tumultuous times, it is right that we remember Republicans who have went before us, it is right that we acknowledge and honour their sacrifice and it is essential that we take lessons from their lives. The legacy that the great patriot dead have left to the Irish people is tremendous, the passion and dedication these exceptional, unique group of people possessed is unmatched in any part of the world. We are not only extremely grateful for their lives and actions but we are immensely proud and hope only, that we can carry on with their life’s work and finally see their ambitions achieved.